Like many of you out there, I grew up with comic books. Fantastic stories of people that had super powers and got to do just about anything they wanted. Fearless. Unstoppable. Pretty darn cool. And, being the young kid that I was, it all seemed quite coincidental. A stroke of luck turns the average bloke into something we all wish we could be. What a lottery! Right? Where do I get myself a ticket for this? It turns out Christopher Nolan and David Goyer own such a wheel of fortune. One where every ticket is a winner. In their reimagining of the world of Batman, the filmmakers chose to go back to the genesis. A subject that hadn't been explored fully anywhere until this point. And it turns out that is exactly what makes this movie rise above all other super hero movies. The exploration of what makes a hero something truly special. But not in regards to being hit by a fallen meteor or mauled by an alien insect. The subject is humanity. Bruce Waine is a little boy that blames himself for the death of his parents. Little does he know it is the machinery of society that is to blame.... Even so, Bruce, now scarred by a simply defining act of the world, he hopes to change it all by taking revenge on his parent's death...Only, even that is taken away from him.... And so he comes face to face with the boogey man running the wheels and learns his first true lesson. Power is not in the money, the success, and the good will of his now long gone parents, or anybody else like them for that matter. As in real life, power resides in mastering the weaknesses of others. Fear. It breathes in everything that surrounds the boogie man. Even inside young Mr. Waine. 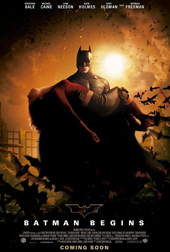 Remember that well full of bats where young Bruce fell? They never went down to deal with the animals. What did they do? They sealed it. Allowing them to roam free down there. It is the weakness in each of us that makes us come to terms with evil. We bargain. Settle. And allow it to exist. Simply looking the other way and allowing it to occupy a nice shelve space. Permanently. And so it begins. How does one become brave in a world that bargains in fear?... To become something we have never been, we must do something we have never done... and so Bruce goes away. Loses himself. Down deep with the filth. Ready to give up and accept an ugly world as it is painted itself. It is in the deepest of dark corners that he learns the road back to a new form of himself. And from no less than the devil himself. Liam Neeson is that flawed character. A previous version of Batman in some other existence. Only he truly fell off the edge. "I loved once," he says. Reminding us we were all human before giving up and letting the dark side sweet talk us away. Bruce Waine returns to the world as an ideal. And the most brilliant aspect in this is that our newborn hero is no space man. He's been taught by men and has learned philosophies long carved by men. He is just one of us. He is the lesson. The torch. We don't have to settle. We seek and we find. Humanity has rebuilt itself repeatedly through the course of history. And most often calamity has driven men forward to make the tough call and find a way to raise above. That is Batman. A reminder of our true possibility. A reminder that we are the hero.